Remember back when cellular phones didn’t have cameras? Now it is a requirement. Considering the low megapixel cameras that are often tacked on to high-priced smartphones, it is nice to see a cellular phone that invests a lot of time in the camera. In the case of the JingPeng E1181, it tried something new. This phone allows the user to completely detach the camera as well as its rechargeable battery and place it up to 30 feet away. Wireless video footage can then be transmitted live from the camera section to the phone portion via RF. The user can then watch it on the phone’s three inch screen. It sounds like something that James Bond would use on a covert mission. It also sounds like something perverts would use to get some shots of the ladies locker room. I suppose “use wisely” should be stamped on this product. Still, you have to admire a company that tries something as innovative as a cellular phone/camera combo. Yes, most users already have a camera on their phone, but it is only used in cases when they don’t have their better-quality digital camera available. 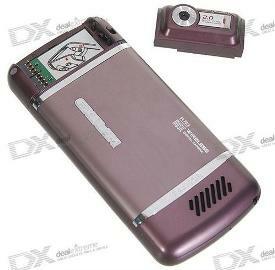 Why not make a cellular phone camera that is so good that it deserves to be detached from the cellular phone altogether? Let us hope that JinPeng did this, but my source does not have the Megapixel count of the camera. I do know that the E1181 has other features like a touchscreen, FM tuner, Dual Sim Slots, and Bluetooth 2.0. It is available for a price of $155. Nintendo DS an E-book reader? Nifty if you work in a secured area that does not permit camera phones. I can think of many uses of a detachable camera. For me personally, working in a security sensitive area is a pain as I can’t take to work a good phone without a camera. This is a great idea. I can take the camera off for work and put it back on at home. In fact I came to this article by searching “Detachable Camera Phone”!! !